Our Best Bet was an easy winner last night as the Predators and Avalanche combined to score 8 goals, soaring over the total of 5. Overall, it was a 6-4 night. The occasional bad days are inevitable in sports betting and we thought we were on our way to one when we lost our first 3 leans of the day, but the late games came through nicely – especially the Coyotes Team Total Under 1.5, which paid +159. There are just 3 games tonight in the NHL. We were quite close to making the Islanders +0.5 in regulation our Best Bet today but the line moved from -117 to -135 before we could get around to posting our picks for tonight, and we’re no longer interested at that price. We still think the Islanders can give the inconsistent Penguins a very tough game tonight, but they’re still the Islanders and we don’t want to lay -135 on them for anything at the moment. Instead, we’ll look to the well-rested Kings to take care of the Sharks tonight in LA. We’ve also got breakdowns and leans on the other two games on the board. Now to start prepping for tomorrow’s 12-game slate! Good luck tonight. The Kings have been very streaky this season, and they’re currently on a very good one. LA’s won 5 straight, allowing 9 goals in those contests while scoring 3+ goals in 4 of the 5. They’re also on a 6-game winning streak at home, and 9-2 at the Staples Centre overall. San Jose’s had good success in LA recently, winning their last 5 visits, but this doesn’t look like a good spot for the Sharks. They had to go to OT last night at home against Arizona, and now they’re playing the end of a back-to-back and 4th in 6 nights against a Kings squad that has been off since Saturday. Also can’t forget that San Jose is 5-6-1 on the road this season. One other reason we’re on the Kings here is good old revenge. The Sharks went 3-0 in LA in last year’s playoffs, when they needed only 5 games to knock the Kings out of the first round. San Jose did beat LA Oct. 12 in San Jose, but this is the Kings’ first home game since the playoff loss and we expect them to be extremely focused to get some payback tonight. Reasons to bet Pittsburgh: Penguins have been off since beating New Jersey 4-3 at home Saturday. Pens have won 11 of last 16 visits to New York. Islanders are 3-9 in their last 12 games. Reasons to bet New York: Islanders always play Penguins tough, earning at least one point in 7 of the last 10 meetings. Pittsburgh has 1 regulation time win in its last 7 games. 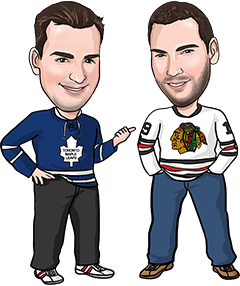 Reasons to bet Toronto: The Leafs have earned points in 5 of their last 7 games and scored 4+ goals in 6 of their last 9. Calgary is 3-7 at home and playing its first home game after a long east coast trip. Reasons to bet Calgary: The Flames have won 9 of their last 10 home games against Toronto. The Leafs played last night in Edmonton and have just 2 road wins in 11 outings (2-5-2-2).